Men’s Frames: Who’s Zoomin’ Who? As we move into 2012, the men’s eyewear market is hot and getting hotter. What do men want in eyewear? While it’s true that some men still want to blend into the woodwork, a growing segment of this market actually wants to use frames as a signal of distinction, if not panache. Amin Mamdani, buyer and vice president of Josephson Opticians in Toronto, has noticed that men expect more from their eyewear. Michael Bohbot, president of Bo Optik, agrees. “Men today are very different and much more diverse than they were a generation ago. Men represent half the population but often have far less choice in frames than women. This was due to a lack of product and a bias towards men being boring. Now men are catching up to women in terms of spending on fashion, be it in clothing or eyewear. They have always spent on watches and suits, but now they want better choices for eyewear and more distinctiveness and diversity. If you don’t have a great selection, you may be missing out on selling multiple frames to a significant market. Bo Optik is one company that has responded to the market with a strong showing of brands just for men. Jhane Barnes and Penguin are brands heavily involved in clothing. The other three are optical only. “All are built on excellence in quality and design and with 75 styles over 400 SKUs (stock keeping units) across the spectrum, we are positioned to satisfy this important market that represents a big percentage of frame revenues,” says Bohbot. Spectacle Eyeworks’ Mehran Baghaie has created a stunning collection of acetates in retro styles for men. In addition to the bold, feminine colours previously mentioned, Baghaie explains that most of this collection is offered in beautifully subtle, natural colours that are very tactile, just begging to be touched. Baghaie has named the pieces after his two sons, Thomas and Shayan, in addition to one with his own first name, Mehran. The family grouping is complemented by Penn, after his favourite actor, Sean Penn. “We’ve made Sean Penn part of the family,” he quips. Banking on retro to stick around for another four to five years, Baghaie’s approach is to take the genre sideways. “Retro is very specific. These new styles are definitely in the genre but have their own distinct character,” he notes. J.F. Rey has always spoken strongly to the men’s market, especially those men who favour an emphasis on technical and design elements. Two techno collections, Fibres and Airnet, are the latest word from this renowned manufacturer. The Fibres collection found the design team turning fiberglass and carbon into an elegant weave. “Featherweight, industrial and elegant,” are perfect descriptors for this subtle collection, where industrial design is reinforced by muted colours in tobacco, navy blue and silver. 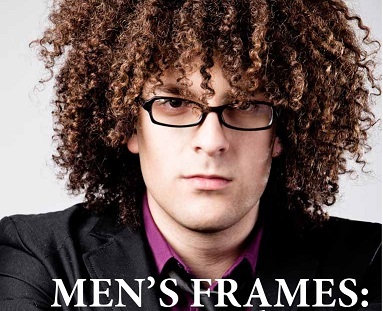 The frames are definitely masculine. Airnet is the first J.F. Rey collection to use ultra-thin stainless steel, providing outstanding lightness. Tiny holes on the temples bring integration with the wearer’s skin tone. J.F. Rey models JF 2410, JF 1217, and JF 1213 are Canadian bestsellers, available at J.F. Rey Eyewear Canada. You may remember Parasite as the company that, a few years back, launched strange-looking futuristic frames with temples that cling to the side of the head. Parasite continues to lead in a ‘techno-organic spirit’, with cyber-punk frames known as Sidero. While still uber-cool, Sidero will appeal to a wider audience, with new models featuring a glossy polyamide front and metal temples. These elegant and edgy frames for men come in sophisticated colour blends and will soon be available with bored lens mountings. Eyecare professionals will be pleased to know that hard-to-fit men are wellserved by the Michael Ryen collection from Cenoco. With a wide range of sizes, the collection offers plenty of choice in both trend-setting and traditional styles. Each frame is made of quality materials, including titanium and Mazzucchelli acetate fromItaly. Spring hinges ensure comfort. MR-176 boasts a square Mazzucchelli acetate front with the trendy geek look now so popular with men, while MR-171 sports a laser-cut, semi-rimless front. A small section of the temple is bent over the hinge and inset with openwork chrome metal, which serves to lighten the look on the face. Prisme Optical Group offers some of the most stylish brands – Orgreen, Cogan, Façonnable – with strong styles for men. They also represent Bellinger, the Danish tour de force, led by the husband and wife design team, Claus and Malene Bellinger Diederichsen. Within the Bellinger collections is Blac, said to be the first frames made totally of carbon fibre. This collection is specifically for men. The design element is very strong, uber-masculine and fascinatingly sophisticated. A must-see. Designed in Switzerland by optical professionals, the Götti collection offers strong masculine models within a mixed-gender collection. “The design of Götti glasses always has a harmonic and coherent look,” says design director Thomas Frischknecht. “We dispense with fancy details while maintaining distinctive accents on each frame, which makes it an unmistakable Götti. All models are extremely wearable,” he adds. The two-man Götti operation that began in Switzerlandin 1993 has grown into a company of 48 employees with an American presence in Winter Park, FL. Product is available at high-end optical shops in 37 countries. Götti SWITZERLAND won a 2012 iF product design award (a Danish award established in 1953) for its Fons sunglass style. Henry Jullien launched Equinoxe at Mido 2011, marking the arrival of the first model in the collection known as Les Urbaines. This acetate and metal frame for younger men is designed and manufactured completely in the Jura region ofFrance, where Henry Jullien has been making fine eyewear for over 90 years. A second collection, Les Signatures speaks to the impressive history of the brand. Here, gold-filled frames in classic styles are made with the finest materials. The Eyefunc collection from Optique Levy features 40 different models for men. PresidentGeorges Levy describes his collection as, “fierce, edgy and hot.” These are manly shapes with trendy urban temples and funky styling, as the name suggests. EF276 is a current bestseller, as is EF307P. “The colours have really helped to make this collection a big success,” says Levy. Optik Innovision brings some striking designs forward for the fashion-conscious man. Allegro Plus 4139 has a retro vibe, mixing new with older elements to great effect in acetate and metal. Allegro Plus 7063, with angular cut-outs on the temple, gives an edgy masculine look in four colour combinations. And half-eye frames such as Allegro 5318 convey a confident charm in a rectangular shape with subtle temple designs. Two best-selling TuraFlex models are M861 and M868. These are both generous frames with a comfortable vertical measurement. The M868 is a lightweight semi-rimless with simple design cues of rolled metal. The M861 is a heavier frame with wider temples and a pinstripe design cue. “These sell well because they are lightweight, have some style without being over the top, and are affordable,” notes Ahola. Le Groupe Optique Plus fromHolland brings the De Stijl collection across the pond with great aplomb. These are architectural pieces inspired by the aviation industry and made without screws or welded hinges. Stainless steel is the material of choice for all metal components and comfort is taken for granted. Extremely durable colours are an outcome of the manufacturing technology and four colours are offered on each of 11 models for men. Look no further than Scandinavian Eyewear for men’s frames with a rich tradition of craftsmanship blended with materials and technology that are very on-trend. Skaga is the brand and Skaga Originals, designed by Sighsten Herrgård, are attracting a lot of attention. Models for early 2012 are inspired by glowing skies and crystal formations. “We have been making men’s styles in the Skaga collection since 1948 and release 48 new styles every year,” says Nils Fredriksson, sales manager forNorth America. Are today’s men getting what they want in eyeglass frames? Are more of them confident enough to let their frames do the talking? Let’s see how they see themselves in the new frame offerings for 2012.